Published August 4, 2016 By Anna T. This post may contain affiliate links. Regardless, I only recommend sites I've researched and/or used and trust. If you're a blogger, or you just want to be a blogger, then you know that one of the best ways to get yourself motivated and inspired is to read about the success of others. I can't tell you how many blogger success stories I read when I first got started. Because blogging isn't necessarily a fast way to earn an income, I found it necessary to read these stories regularly to keep me from feeling like giving up. Today, I have an interview for you with Suzi Whitford of Start a Mom Blog. 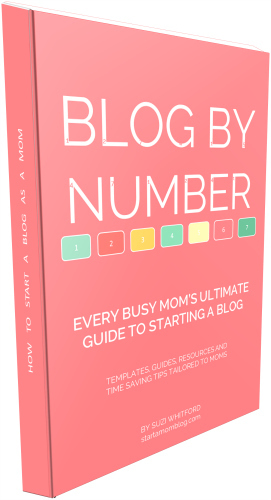 Suzi has also written one of the most informative, step-by-step guides for new bloggers that I think I've ever read. And, trust me, I've read a ton of blogging eBooks! Unlike many other how-to blogging books, Suzi's book doesn't skip the basics and assume you already have your blog set up properly. She walks you through every step of the process, beginning with buying a domain name and hosting plan. I was extremely impressed with it, and I've already recommended it to several new bloggers I know. It's 141 pages long, so there's lots of info there, but it's structured in a way that makes it not overwhelming. And despite the name, this book is not just for mom bloggers. I cannot stress that enough. You would find this info helpful no matter what type of blog you plan to start. I've always been very techy. I studied Industrial Engineering and was a teaching assistant for my computer coding class. Being behind a computer and learning new tech things have always been very interesting to me. My husband is an Industrial Engineer as well, so we are a pretty nerdy couple. Once I became a stay at home mom I needed an outlet for my creative energy. I couldn't watch Netflix all day and I wanted to help out our family financially. So I turned to blogging. It's as techy as you want it to be and it has the ability to bring in a nice income. I also needed something for me. Changing diapers all day, breastfeeding and play dates are great, but I started to feel lost in motherhood. I used to be in the corporate world before I became a stay at home mom and I missed the networking and the challenge … and the adult conversations. Blogging has filled that void for me. I can now spend my time working on improving myself and my blog while my babies are sleeping. And when they wake up, I am a fully engaged mommy. What has been the most challenging aspect of blogging for you? Balance. When I first started blogging I got a bit carried away. I would stay up too late blogging and wake up the next morning exhausted. Once I learned how to balance blogging and family life everything fell more into place. There are a few big priorities in my life, and if I neglect those, the rest of my life becomes difficult. So in order of importance I first take care of my Faith and family, secondly my sleep, thirdly exercise and last my blog. If the first few things are not taken care of, my blog suffers. I would rather only get 1 hour to work on my blog and have a fresh and rested mind and a happy family rather than get 3 hours to blog, but then not be able to think clearly and leave my family feeling neglected. It took a while to realize that quality of time is much more important than quantity of time when it comes to blogging. What social media platform has been the most beneficial for your traffic? By far, Pinterest. Most of my audience hangs out on Pinterest and Facebook. I've been using Tailwind to schedule all of my posts and it has been amazing. It takes me 30 minutes each week to set up my queues which then sends me constant traffic each day. I can't recommend it enough, especially for busy moms! Are there any social media platforms that you've found aren't worth the time? I can't be on all the social media platforms because my time is limited. But I have found that not a lot of my audience hangs out on Twitter. Although I love using Twitter to communicate with other bloggers, it is not the best platform to reach new readers. On average, how long does it take a new mom blog to start earning a small income provided the blogger is able to work on it at least part-time (5-10 hours per week)? I was able to make $200 my first month of blogging. But this can vary greatly between bloggers. If you can dedicate a few hours every week to blogging and you focus on the things that will make the most impact, you will be able to start making money from your blog within a few months. Making money with a blog is not an overnight thing. It takes time and dedication. But unlike other jobs, the potential for income is enormous and the flexibility is amazing. Many mommy bloggers I know make between $2K – $15K with their blogs per month, and they have been blogging for less than 3 years. It seems that the mom blog niche is so saturated. And yet, new blogs in this niche come out of the woodwork and begin doing well every day. What would you say is the real key to standing out in a sea of other mom bloggers? Great question! It is very true, there are so many mommy blogs, so how do you stand out? Blogging has definitely changed a lot over the past few years. So many millennial moms are starting blogs because they used to be in the workforce before becoming a mom. And blogging is a great way to fulfill that drive and passion for a creative outlet. The moms who are starting blogs today aren't just using it as a journal, they are creating online businesses. And with all the free tools out there it is easy to make your blog look professional. WordPress has many awesome free themes, Mailchimp is free for up to 2,000 subscribers, SumoMe collects emails on your site, and Canva and Pickmonkey are both free to use to create amazing graphics for your blog. Starting a blog is a great idea if you're a mom who needs a creative outlet, craves adult conversation and wants to make money from home. You can have a very professional website up and running for under $5 a month. The biggest challenge I see new moms have with starting a blog is not having time to do it all. 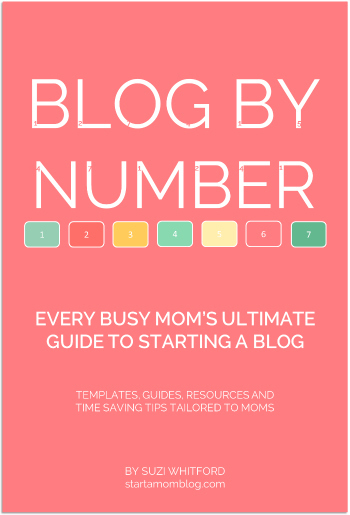 So I created an ebook called Blog by Number to help busy moms start a blog. It has step by step guides, templates and resources so you can start your professional looking blog quickly and easily. If you are interested in starting a blog to have adult conversations, a creative outlet and make money from home, I would be honored if you checked out my ebook. You are also very welcome to email me at suzi @ startamomblog.com with any questions – I'd be happy to answer even if it's just a one sentence email! P.S. – Since this interview was written, Suzi has expanded on her blogging resources and created an e-course that provides a lot more detail on blogging. The course is very affordable at just $47 (a steal compared to the cost of most blogging e-courses). I have been through the information and as someone who blogs professionally, I can tell you it's worth more than the cost of the course. And I’m at 150+ sales now! Thank you! Yay, that is great Suzi!! Thank you so much for the opportunity to be interviewed by you. I enjoyed your questions and I hope your readers will too! I have just sold my 104th Blog by Number ebook, it’s going super well!! Yay, congrats on your 104th sale! Thanks to you as well for answering the Q’s for us. I was very impressed with your eBook.